Here is another of my favorites from the International Quilt Festival. 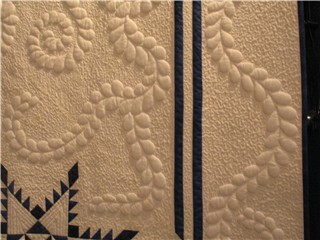 Titled Feathers, this quilt was machine pieced and machine quilted by Winifred Masson of Brampton, Ontario, Canada. It utilizes trapunto in the quilted feathers. Winifred commented that this was the most difficult quilt she had ever attempted and several times she thought it had defeated her. Looks to me like she won out in the end! It is an amazing quilt. Not only the quilting but also the piecing. Lucky that she didn’t give up on it. I have to echo what Joyce said. Good thing she kept at it and won the war. Oh, my! Thanks Deb. What a beautiful thing that is. Simply gorgeous. I would never finish such an intricate piece. She’s a winner in my book! Another stunning quilt! 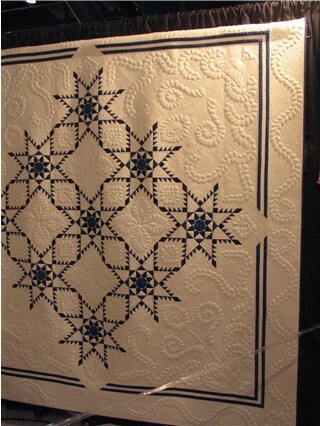 I would love to have a quilt like this but I doubt I would ever make one–maybe the piecing but that machine quilting is pretty over the top. Was this done on a longarm? Somehow that seems like it would be “easier”; easier being a relative term here.